(10 to 30 cms) tall in nature. 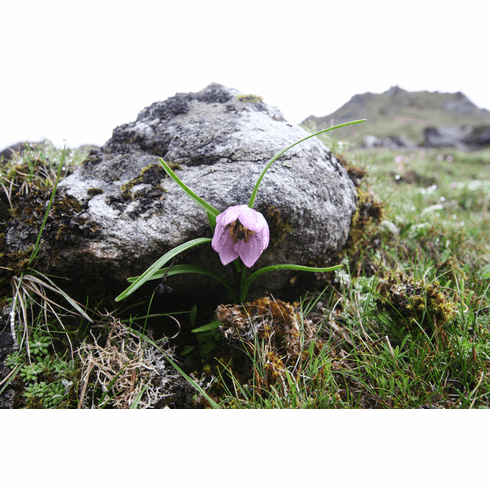 Lilium nanum is found distributed through the Himalayas especially in the Dequin and Gongshan areas of the Yunnan. Title photo was taken in Bhutan. Taxonomists classified this lilium species as a 'nomocharis' for many years. The bell-shaped pink-to-lilac flowers have purple spots. Found in cultivation for over 100 years, bulbs are rarely seen available. In nature Lilium nanum is found found grassy mountain slopes, growing on cliffs, and in the Sequoia margins where it flowers in June with seed ripening in September. Seed germination is immediate epigeal. It highly dislikes being moved and is best started from seed planted where they can just be left alone. Often takes 5 or more years to flower and then dies for no apparent reason other than to frustrate the grower. Title photo in natural habitat by Mr. Sonam Wangchen who operates 'Bhutan Excursions. 'Bhutan Excursions and can be reached at www.bhutantour.bt for those wishing to see this rare and delicate beauty in person. What Mr. Wangchen and his tours members see in person is that of which most of us can only dream. Photo copyright Mr. Sonam Wangchen, Bhutan Excursions, all rights reserved. Used with permission. Photo insert #1 taken by Pontus Wallsten of Switzerland. Coypright Pontus Wallsten, all right reserved. Used with permission. Photo insert #2 is from Wikimedia Commons and was taken by Karl Kristensen http://www.kalle-k.dk. Original photo was cropped. Source Wikimedia Commons. Insert photo #3 taken by Edward McRae at Keillour Castle in Scotland. Ed insisted that if you wanted to grow this lily successfully, you had to live in his beloved Scotland. Photo inset #4 taken by tour client of Sonam Wangchen in habitat area of L. nanum. Copyright Sonam Wangchen, all rights reserved. Used with permission.